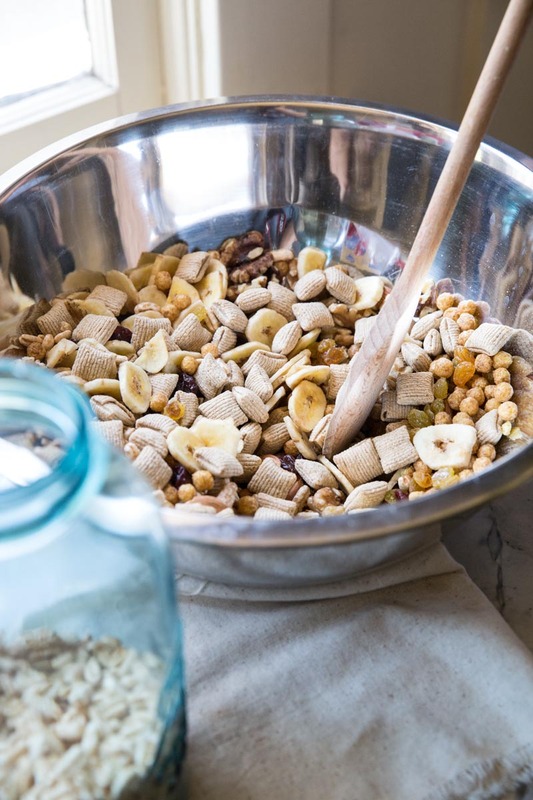 At the beginning of the Summer we made this massive bowl of healthy trail mix. 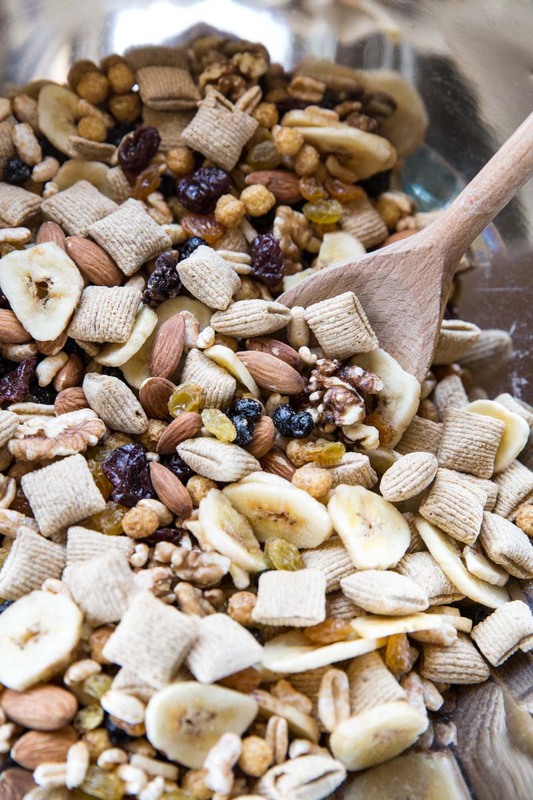 This mixture of healthy cereals, dried fruit, and nuts, fuels our coming and going, every Summer adventure that comes our way. 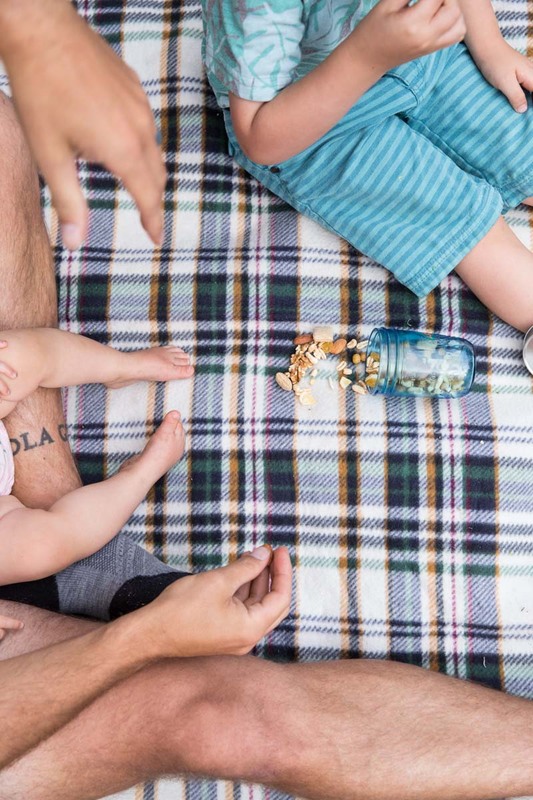 Every handful has something for everyone in the family to snack on, even the baby loves it! Weather we are headed out for a hike or a picnic, swim lessons or a play date, my backpack always has a jar filled with this trail mix hidden inside. The mixture is simple yet has enough variety that it never gets boring. Everyone in the family contributed at least one favorite snack to the mix, even little Ruthie, who at the time was about 10 months old. She enjoys the raisins and the puffed kamut. Everett picked out his favorite healthy(ish) kids cereal and Josh picked out his as well. I’m a sucker for dried fruit and any cereal so I’m easy to please. And the best part, my 4 year old can stir it all up and say he made it all by himself (kids cooking at it’s finest!). As Summer comes to a close, I see this mixture also finding its way into school lunch bags for snacking. We’ve come to require it anytime we’re away from home. • If there’s a baby in your family, try finding puffed kamut in a bag in the cereal isle of most grocery stores. It’s a natural whole grain cereal without any sugars or any additives, only one ingredient on the label. We use it for snacking from 6 months to 12 instead of puffs (it’s cheaper and better for your baby). Of course if you’d prefer puffs, they would work well in this mix too! 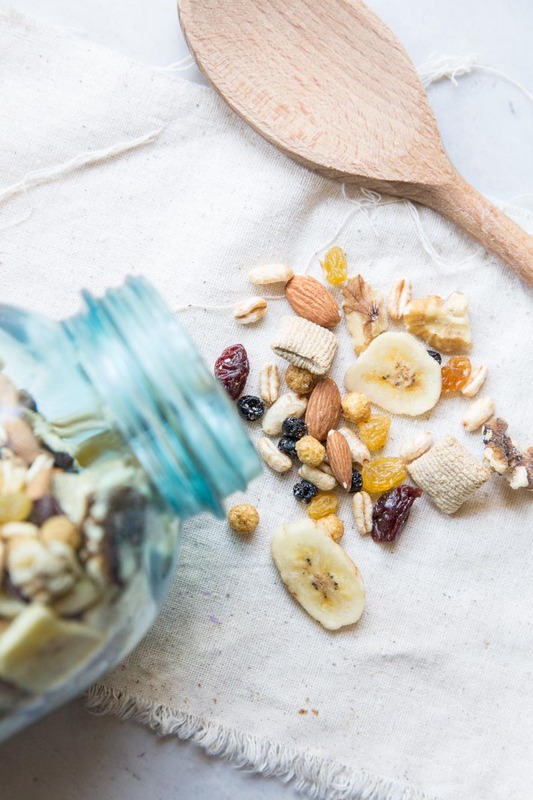 • Many people put chocolate in their trail mix but we don’t only because it’s so hot here in the summers and I don’t want any melting to happen in our trail mix. 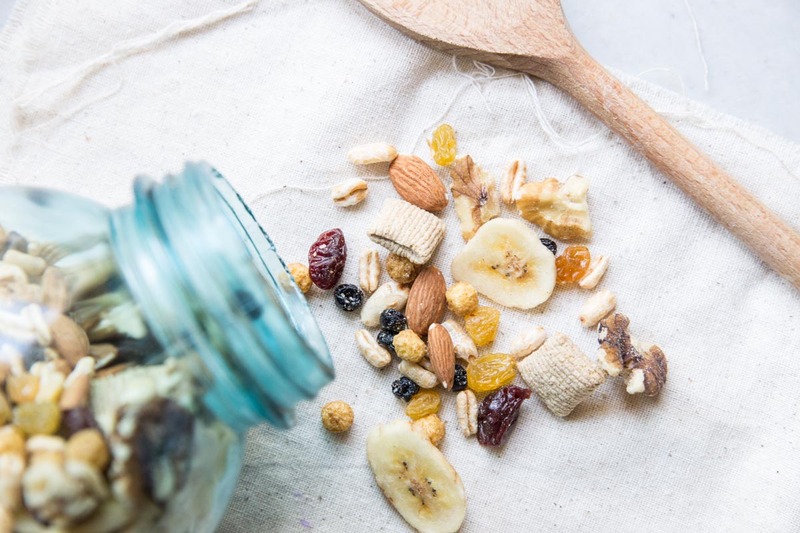 This mixture has a shelf life for a few months so you can leave it in a jar in your pantry all Summer or if you leave it in a jar in your bag for several days it will also stay good. • We use raw nuts which give a healthy dose of fat, antioxidants, and nutrients without any added fat from oils etc. Overall, raw nuts have more nutrients than roasted (generally speaking roasting the nuts processes them and takes away some of their nutrients). • For the dried fruit in this mix we use dried fruit without any added sugars. Check the labels on the back of the dried fruit to see if the manufacturer is adding in sugar to the fruit. • As for the cereals, we go for a healthy whole grain cereal for the main one and for the kids cereal, we go semi healthy here and a are okay with a little sweetness. 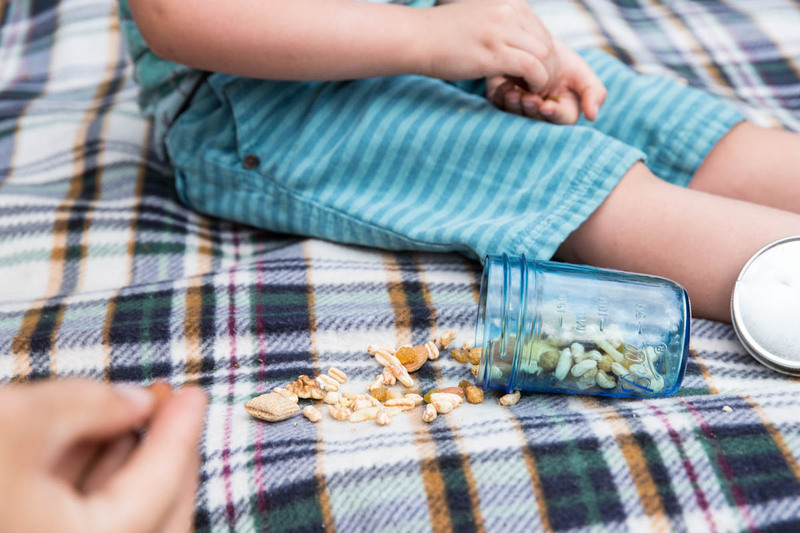 We’ve almost made it through our first big batch of this trail mix so we’ll be making another big batch soon for late Summer and early fall adventuring! Oh and pre-school… my oldest is starting school this year, which is hard to comprehend but you better bet he’ll be leaving the house with good food in hand! 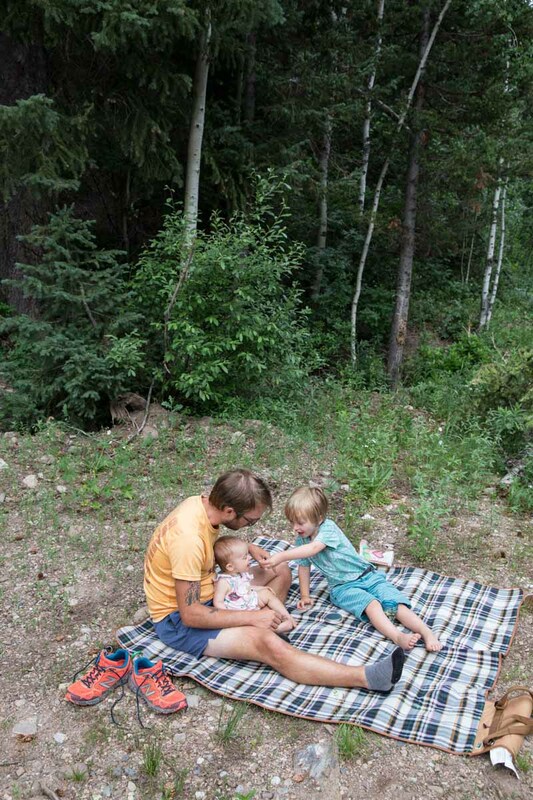 There's something for everyone in your family in this healthy trail mix. 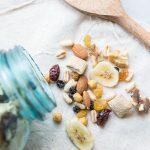 In a large bowl mix together all of the ingredients or have your kids mix it up. Then use a measuring cup to pour it all into a large 2 quart jar or container. If you can find dried fruit with no sugar added, go with that. I always look on the ingredient list and try and find a product that doesn't add any sugar. Dried fruit is sweet enough on its own.